Click any image to expand/collapse information. 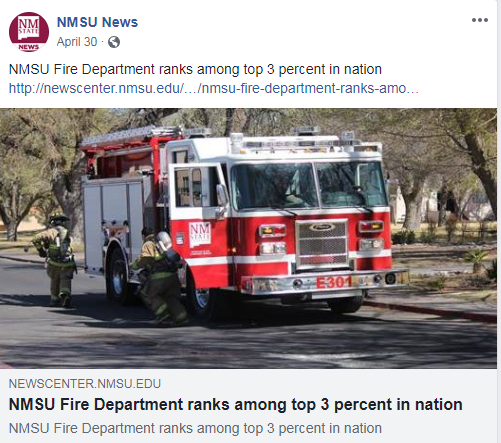 NMSU Fire Department ranks among top 3 percent in nation. NMSU does not collect household batteries for disposal and the State of New Mexico does not have any stringent regulations on disposal of household type alkaline batteries. The City of Las Cruces will accept the lithium ion and nickel-metal hydride type recyclable batteries at their collection site located at 2855 W. Amador, Las Cruces, NM. If possible, we recommend recycling your batteries. Check out this recycling website. You have probably participated in fire drills in schools or campus but have you ever had a fire drill at your house? It is crucial to know how and where you can evacuate from your house in case of an emergency. Be sure to know what doors and windows you are able to open and get out of at any time, and make sure the children living in your house know too. It is extremely important that you practice fire drills at your house and/or on campus so that you know where to go and feel confident in doing so. The more you talk about the possibility of there being an emergency and practice what actions to take, the more likely you will act appropriately in a real emergency. It’s a perfect time to change your batteries! Twice a year when the time changes, change your smoke alarm and carbon monoxide detector batteries! New Mexico State University Fire Department wants to remind you that it is important to check your smoke alarm and carbon monoxide detectors every month to ensure they are in working condition. However, if you do not have smoke alarms or carbon monoxide detectors in your home off campus, we strongly advise you to go pick up a few from your local home improvement store. Smoke alarms and carbon monoxide detectors are installed in all facilities on campus including family housing. They are simple detectors that are composed of two main parts (sensor/audible alarm) which allow the detector to notify the occupant that there is a hazardous smoke or carbon monoxide filled atmosphere. The sensor picks up tiny smoke particles in the air which then triggers the audible alarm which consists of loud beeping noises. These alarms normally operate off of 9 volt or AA batteries which are easily installed into the back of the alarm. Alarms normally come with instructions on the back of the detector which tells you how it operates and what the different audible alarms mean. There is also a test button on the alarm which notifies you if the detector is functioning properly. These alarms are installed for your well-being and to notify you of a smoke or carbon monoxide filled atmosphere. It is a colorless, odorless gas and byproduct of incomplete combustion. Where are my detectors located? Normal locations for alarms are usually high on side walls or on ceilings. Smoke travels upwards first due to heat, detectors need to be in high areas for early detection. When do I check my detectors? Alarms should be checked on a monthly basis to make sure they are functioning properly using the test button on the side or face of the detector. A common case of detector malfunction is the batteries being dead and need to be replaced. Smoke alarms notify the occupant of a hazardous smoke filled atmosphere. This can prevent the occupant from harm and let people know to get to a safe environment. Should I also have a carbon monoxide detector? Carbon monoxide detectors are highly recommended. They offer warning that unburned gases exist that may otherwise be undetected until it is too late. 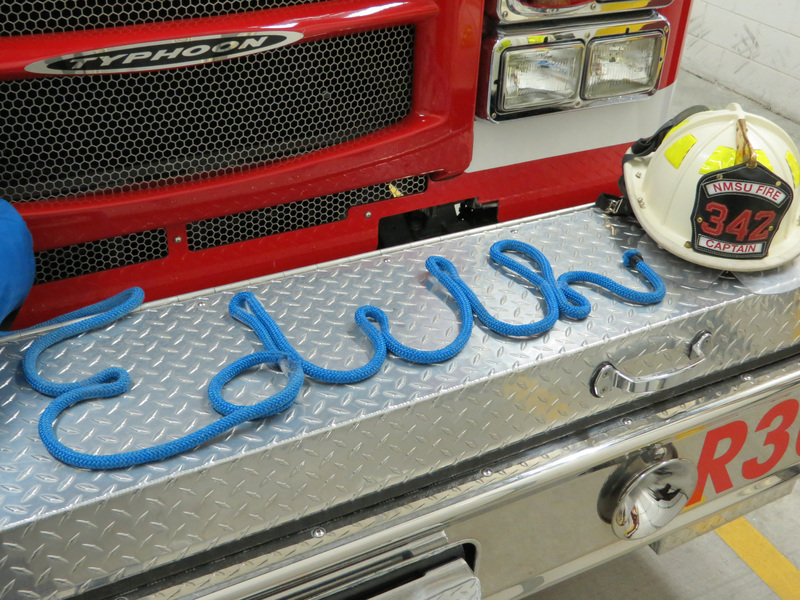 Note: Always notify the fire department in case of emergency and when your smoke detector is activated. What can you do to disposal of your “vegetative material” properly? On NMSU Campus, there is a “No Open Burning policy” under our Fire Prevention Guidelines; see those guidelines for specific information. The City of Las Cruces Fire Department has issued a “No Open Burning” ban within the City limits, effective Tuesday May 28, 2013. Their current policy can be found here. Doña County also has strong restrictions on open fire burning. Their current policy is located here. State of New Mexico produces a brochure about the dangers of backyard burning. It is good to know these rules so you can be safe and be informed. If you find someone not in compliance, and it is not a threat to life or property, call your local non-emergency Police Department. In an emergency, always call 9-1-1. Their risky behavior might not only affect them if something gets out of hand. How to make sure your holiday lights are used properly and safely. With the holiday season just around the corner, you might be getting ready to decorate your home with Christmas tree or outdoor lights. New Mexico State University Fire Department would like to share a few tips with you on how to make sure your holiday lights are used properly and safely. If you choose a cut tree, make sure it is fresh and not dry. Dry trees catch fire easily. Make sure to check your use and new strings of lights for frayed wired, cracked bulbs, open sockets, and excessive kinks. Do not use tack, screws or nails to hang lights. Avoid metal to metal contact. Be sure that if you are using lights outdoors that they are rated for outdoor use. 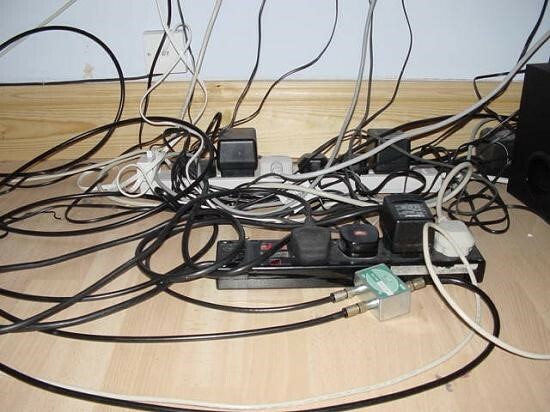 Do not over exert an outlet or power strip. Do not leave the lights on when you leave the house. On another note please use caution when using ladders while putting up the lights. Don’t be a part of a statistic! The National Fire Protection Association (NFPA) and the U.S. Fire Administration (USFA) data notes that an estimated 240 home fires involving Christmas trees and another 150 home fires involving holiday lights and other decorative lighting occur every year. Together, these fires result in 21 deaths and $25.2 million in direct property damage. Please take a look at these tips and share them with friends! 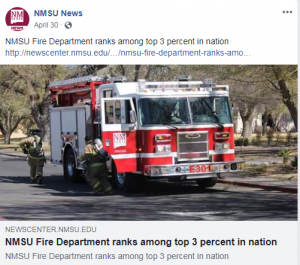 It is always important to be safe when driving and the New Mexico State University Fire Department would like to remind you that you must be even more cautious during these holiday months. Typically, there are more drivers you will be sharing the roads with and the higher possibility of hazardous road conditions. • Leave early–give yourself plenty of time to get to your destination. • Don’t drive with an attitude. If you are upset, pull over and cool down or better yet—let someone else drive. • Don’t use your cellphone while driving; pull off the road if you need to use it—driving requires your full attention. • Keep your eyes on the road at all times—stay fresh and alert. • Maintain your vehicle—get that tune up! • Use extreme caution in work zones—keep your speed down. • Keep your windshield and lights clean. • Know when to use your bright lights. • Pull over and stop your vehicle if you do not feel comfortable driving in the presenting weather conditions. • Be flexible in your driving plans. 7. Do not re-enter a building even if the alarm is no longer active. Emergency personnel may silence the alarm while they investigate. Only re-enter after the building is declared safe by the Fire Department. False Alarms Universities have suffered loss of life due to students, faculty and staff becoming complacent and assuming an alarm is false, and not being able to escape when they had the chance. Many fire alarms turn out to be false, but no one can be sure an alarm is false until after the response. The Fire Prevention Guidelines serves to help guide you through the NMSU Fire Department practices. It is always recommended that you seek advice from the Fire Department’s Administration office if you have any questions. Where can I sign up for CPR classes? Call the NMSU Fire Department during normal business hours to sign up for a class. Check this link for more information about our CPR classes. Where can I sign up for fire extinguisher training classes? Please sign up for classes through Training Central. If you have a group and want a different time, please contact our Administration office at 575-646-2519 to schedule a private session. If have an expired, old, used portable fire extinguisher. How do I replace it? Please create an AiM Work Order request. Do you get cats out of trees/telephone poles or roofs? No, it is best to allow cats to come down on their own, generally when they get hungry. Will you unlock my car if my keys are inside? 1. Person(s) locked in a vehicle that is incapable of unlocking the vehicle and is in immediate danger due to heat or another medical condition or pet(s) locked in closed vehicle without air conditioning. 2. Vehicle locked and running INSIDE of a structure producing a hazardous atmosphere. 3. Medications locked in the vehicle that is needed for immediate use. 4. Other situations where the locked condition of the vehicle is an obvious threat to the safety of persons or property. How do I become an NMSU firefighter? Check our Firefighter recruitment page. How come I see a fire truck with full lights and sirens slow down? Firefighters are constantly fed information from our dispatch center to update them on the status of an emergency. Most likely when you see an emergency vehicle go lights and siren through a red light and then slow down and turn off the emergency lights, they have been cancelled from the call they were going on. If I want to have a barbeque on campus, what do I do? j. Agricultural and/or weed control by burning is prohibited. When do I have to fill out an Activity Registration Form?